Mykonos and Santorini are among the most popular destinations for island hopping in Greece. The former is a party hub famous all over the world. The latter boasts indescribable sunsets, colorful beaches and the well-known Caldera. 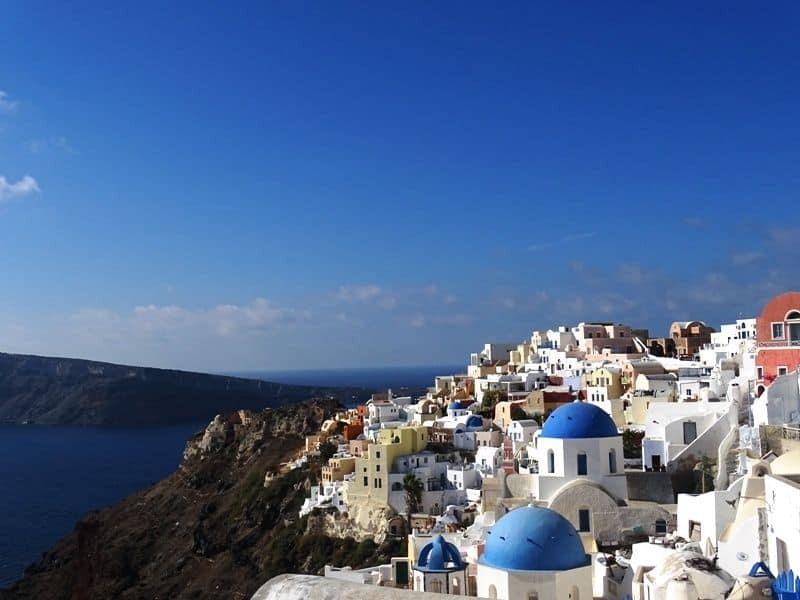 More so, there is myth stating that Santorini Island is the site of legendary Atlantis. For these and many other reasons, the islands are mandatory stops in itineraries of many travelers. Climate conditions are ideal on the islands of Santorini and Mykonos. Temperatures are mild in winter and pleasant in summer. Yet, you should consider certain points before start packing for a trip. 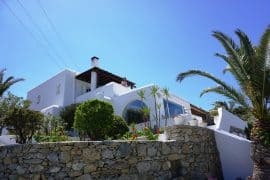 In this article, you can learn the ways of getting from Mykonos to Santorini, the Cyclades Islands, Greece. 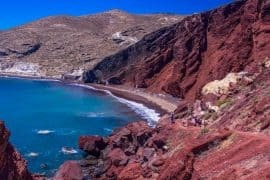 Shall you book your ferry ticket from Mykonos to Santorini in advance? Taking a ferry is often the simplest and the most affordable mode of transport between the islands. It is the scenic experience offering a big pleasure. Yet, the ferry schedule tends to be quite different from one season to another. Also, travel times vary to a large extent from one ferry to another. In the following, you will inform yourself about the key points of traveling from Mykonos to Santorini by ferry. Direct ferries travel from Mykonos to Santorini daily between April and October. The rest of the year, options are usually pretty limited. At those times, commuting between the islands includes Athens as the intermediate point. There are usually a few ferries commuting on a daily basis between the islands. During summer (high season), you can choose among several departures on a daily basis. July, August and September are especially busy months. 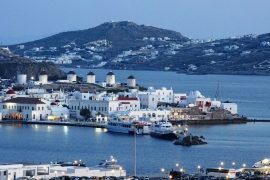 During these months, ferries leave the port of Mykonos between mid-morning and late afternoon hours. During other months, departures take place until mid-afternoon, in general. In most cases, vessels start sailing toward Mykonos Island soon after they arrive in the port of Santorini. Click here for the ferry schedule and to book your tickets. Times you will spend on board a vessel mainly depend on the chosen ferry company. Vessels of various companies run between Mykonos and Santorini islands. Golden Star Ferries, Sea Jets, Hellenic Seaways and Minoan Lines are some of them. Fast jets of Sea Jets and Hellenic Seaways travel between the islands up to 3 hours or so. We could say about the same for Minoan Lines. 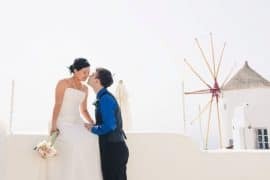 Their Santorini Palace needs about 3 hours to cover the distance.Especially fast direct ferries transport passengers from one island to another in less than 2 hours. Golden Star Ferries disposes of a fleet of both slow and relatively fast ships. Vessels of this company usually need between 4 and 5 hours to travel between Santorini and Mykonos. Some ferries make stops on the islands of Paros and Naxos along the way. Yet, such a practice doesn’t prolong the journey for long. In general, tickets for fast ferries are more expensive than for slower ones. Hence, passengers that prefer to travel fast usually pay a higher price. Still, exceptions do exist. So, keep an eye on different providers for a chance to travel faster and cheaper. Ferries traveling from Mykonos to Santorini dispose of a few classes that dictate the price. Those are Economy, Business and VIP. Most travelers book Economy class for a variety of reasons, including affordable fares. Back to the beginning. The most affordable deals are on offer by Golden Star Ferries. Vessels of this provider usually travel from Mykonos port to Santorini port between 4 and 5 hours. Prices are from around €40 upward. If time is of the essence to you, a ticket for a ferry that travels 4 hours should cost extra €10 for Economy class. As for Sea Jets fast ferries, for example, deals typically start at €50 or so. To get between the islands in 2 hours, the ferry ticket should cost you around €70. If half an hour more or less doesn’t make a difference to you, you can save some €20 for a journey. An upgrade to Business or VIP class costs about €20 more than economy class. The best website to use booking your ferry tickets is Ferries in Greece, since it’s easy to use, convenient, and has all the timetables and prices to help you make a decision. I also like that it accepts PayPal as a payment method. For more information on how to get your tickets and the booking fees click here. Alternatively, you can either get your ticket from Mykonos port or any travel agent in Mykonos. You usually don’t need to book your ferry tickets in advance. If you need to take a specific ferry on a specific date. If you are traveling by car. If you are traveling the week around the 15th of August, Orthodox Easter week, and public holidays in Greece. – Think with care about whether to book a fast or a traditional ferry service. Fast ferries are sensitive to rough seas. Because of that, many passengers experience seasickness on board those ferries. – Another thing about fast ferries is the lack of views. None fast jet has an open-air deck. Even if your seat is by the window, it is very likely to be wet from the outside. 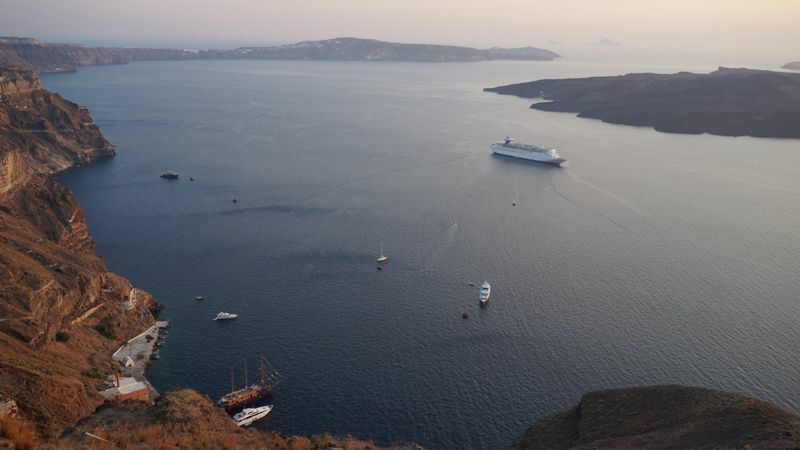 So, book a traditional vessel with an open-air deck to enjoy splendid views of the Caldera on Santorini Island. – To get to an island and back, you need to buy 2 one-way tickets. Tickets for return trips aren’t on offer. – In general, you don’t need to hurry to reserve a ferry ticket. It is often possible to buy the ticket on the day of the journey. Yet, don’t take the risk, even if it is small, from July to September. During these months, reserving a ferry ticket a two to three weeks in advance would be wise. – Keep an eye on the schedule because companies might change timings all of a sudden. – Unless you need a bit of privacy or a more peaceful setting, upgrading from Economy to Business or VIP class isn’t particularly worthwhile. -In most of the cases, you will have to leave your luggage in a storage room as you enter the ferry. Take all valuables with you. Flying between Mykonos and Santorini islands is inconvenient most of the time. Direct flights might be available from April to October. If they are, airplanes don’t fly every day. The flight lasts a bit over 30 minutes and fares range from around €30 to €80. In any other case, you will need to fly to Athens for a connecting flight. And layover times and related fares make this option very inconvenient. So, getting from Mykonos to Santorini is usually faster and less expensive by ferry than by plane. 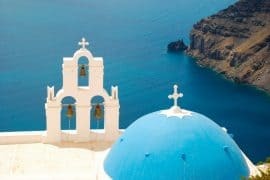 Even if you book a direct flight, airport procedures will prolong your journey to Santorini Island. So, the ferry should serve you better regarding prices, times and flexibility. Even if you don’t tolerate rough sea, a big, traditional ferry should prevent you from becoming seasick. 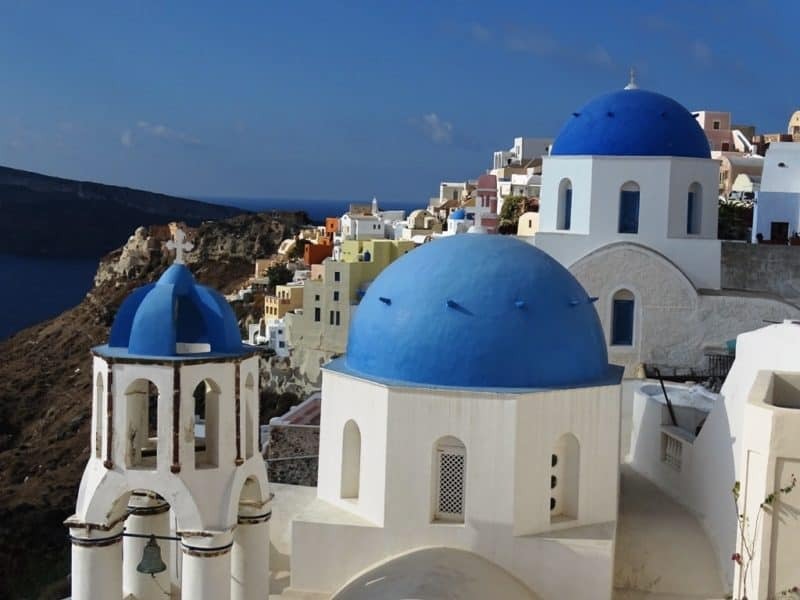 How to get from Athens to Santorini. 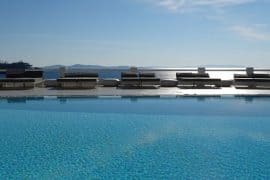 Where to stay in Mykonos. The best day trips from Mykonos. Things to do in Mykonos. The best beaches in Mykonos. Things to do in Santorini. The best beaches in Santorini. If you have any questions leave a comment below. Previous articleWhere to stay In Malta – A local’s guide to the best areas.